Bluebird Care provides care and support for the elderly and adults in their own homes. They treat everyone as an individual, ensuring that their care package is tailor-made to match their support needs and what is important to them. They help people in Shropshire remain as independent as possible in their own homes by offering services such as: personal care, medicine management, domestic tasks, meal preparation, short term and long term live-in care. 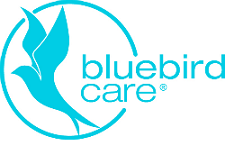 Blue Bird Care were awarded the 2014 Care Business of the year Award. Follow Bluebird Care on Facebook. Follow Bluebird Care on Twitter.